Recruiters are branching out and trying new ways to attract candidates. Companies are luring candidates with creative job postings in many places besides the job boards. You’ll also see job postings featuring pictures of employees having fun on the job and a-day-in-the-life interviews. Companies are doing more to provide candidates with information to be informed applicants and it’s about time! Why would a recruiter go the extra mile to post jobs in other places? One reason is to attract people who are already working and who aren’t actively job seeking. Another reason is to meet candidates where they are active. In short, hiring volumes are up and candidates are harder to find. Recruiters have found that candidates are more selective and want more information about a company before applying. Companies that do a better job showcasing their company culture and perks have a better chance at catching the attention of finicky job seekers. Job boards aren’t the only place employers go to announce jobs. Have you tried these? The company’s career page features job postings and you’ll often get a glimpse of their work culture. Don’t stop here. Look for links to the social media platforms the company uses. Instagram, Facebook, Twitter and LinkedIn profiles give you the opportunity to learn what the company is up to, discover job postings and the real bonus, to interact with people managing the social media accounts! If you haven’t identified target companies you would like to work for yet, you can search social media platforms to find jobs using a hashtag, or number sign. Try searching Twitter, Instagram or Pinterest for your new job using the job title preceded by the hashtag, for example: #webdesigner, #customerservice or #accounting. You can also try #job to find openings. If you chose this option, you’ll have to sort through many different jobs, but you will learn which companies use social media to promote jobs. If you are already using Instagram to catch up on your personal interests, then you have seen how companies are using Instagram to connect with customers. Employers are trying to lure employees using Instagram, too. Go ahead and follow your favorite companies to keep up with their career news. Similar to Instagram, some recruiters have tried sharing job postings on Pinterest to attract candidates. See if any of the companies you are interested in working for have an account and pinboard for career opportunities. Don’t dismiss this popular network as a source for job announcements. You may find a friend sharing a job opening through a status update on Facebook or a company highlighting a new opportunity on their Facebook page. Facebook groups also serve as a way for recruiters to list new jobs. Look for groups on Facebook relevant to your occupation or industry or perhaps even the city you want to work in. This may be the place you go to find a deal on a new-to-you purchase, but it can also be a recruiter’s alternative to the job boards. Craigslist serves as another vehicle for recruiters to post jobs where they know people are already spending time browsing. As with any job posting, be smart and practice digital defense. Never share social security numbers or other personal information online or through email. And be sure to check the background of the company and people you are interacting with. To beat the odds and stand out as a candidate for a job, start talking to people inside a company before the job is posted. Referred candidates have a much better chance of getting interviewed and hired. Start your search by making a list of people you know and begin networking. LinkedIn offers a job board. The newest features within LinkedIn provide you with more information about culture and the career paths of people in similar roles. You can read more about these changes here. Either as a side project or to keep your skills fresh, project work is just another option to generate income. And if you do a great job, who knows, the company may hire you. 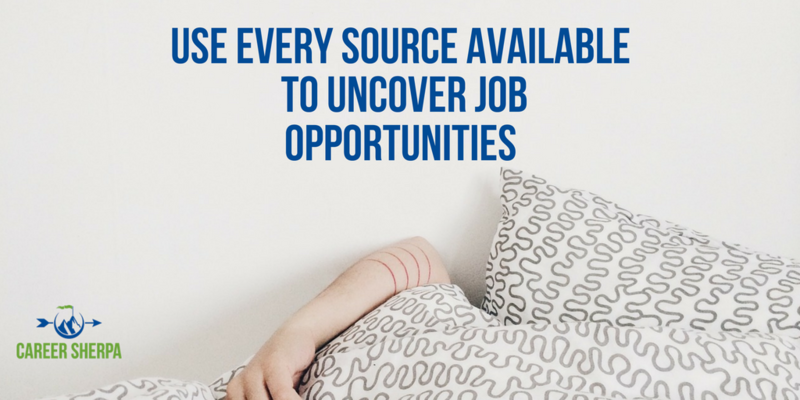 To give your job search and networking efforts focus and to learn about jobs before they are even posted, create a list of companies you would like to work for. Learn how and why to build a target list here.